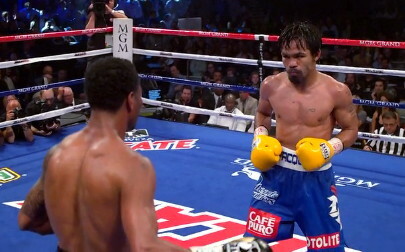 By Chris Williams: If you were hoping to see World Boxing Organization (WBO) welterweight champion Manny Pacquiao finally face Floyd Mayweather Jr next year, you might not be happy to learn that Pacquiao’s promoter Bob Arum is still talking about Pacquiao being tested by the WADA while he’s in the Philippines training for a Mayweather fight, while Mayweather is being tested by the USADA in the United States. This isn’t what Mayweather wants, a non-USADA agency testing Pacquiao. It’s sad that Arum isn’t changing his stance on this, as Mayweather has been very clear about this issue. He wants the Olympic style testing for performance enhancing drugs to be conducted by the USADA, and not some other agency. Both Arum and Pacquiao really want the Mayweather fight, which is why it’s sad Arum isn’t agreeing to what Mayweather is asking for. Although there’s a slim chance that Mayweather could back off from his preference of wanting the USADA to do all the testing, I wouldn’t bet on it. I think with Pacquiao way over in the Philippines being tested by the WADA, which would contract out to local laboratories to have Pacquiao’s blood tested, it might cause Mayweather to be very suspicious about the results of those tests. Mayweather obviously wants the money and fame that comes with fighting and beating Pacquiao, but I kind of doubt that he’ll be okay with the WADA testing Pacquiao in while he’s out of the country. Arum seems to be willing to risk the fight not getting made by wanting the WADA to do the testing despite Mayweather saying repeatedly that he wants the USADA to do all the testing. That makes me wonder whether Arum really wants this fight. I can see he wouldn’t. If Mayweather fights Pacquiao, the chances are incredibly high that Mayweather will beat Pacquiao, and in the process we could see Pacquiao’s paydays go down once he gets beaten depending on how badly it is. If he’s kept away from Mayweather, Pacquiao can make $20 million paydays against pretty much anyone Arum puts in front of him from his Top Rank stable. He doesn’t need to fight someone like Mayweather to keep the Pacquiao gravy train going for the next two or three years until he retires. But if he fights Mayweather, the gravy train could come to a screeching halt after one big payday. If you do the math, it seems a better deal to keep Pacquiao away from Mayweather so that the gravy train stays on the track.